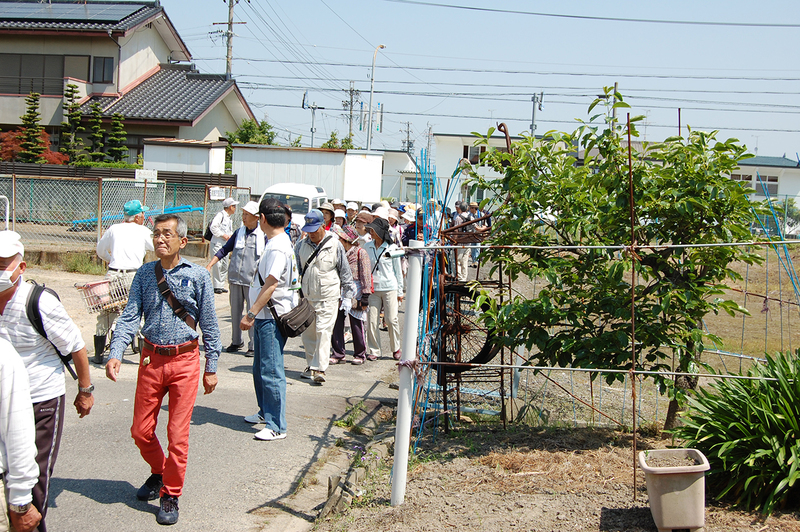 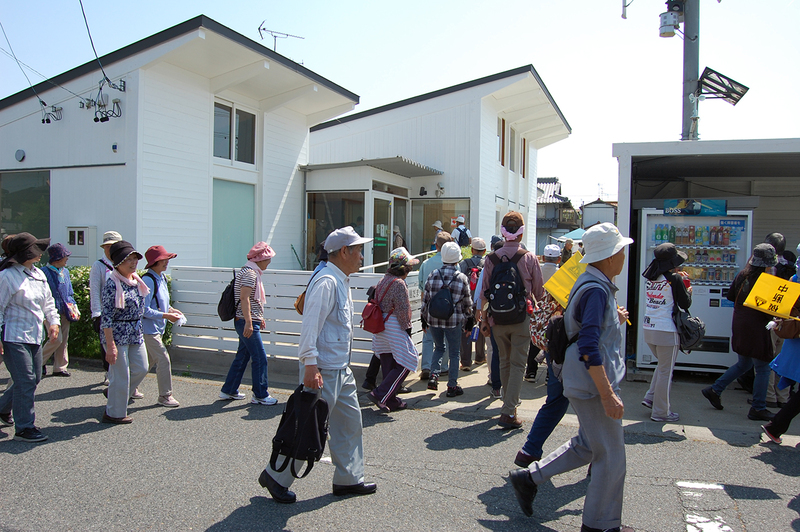 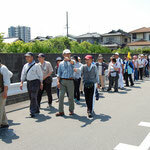 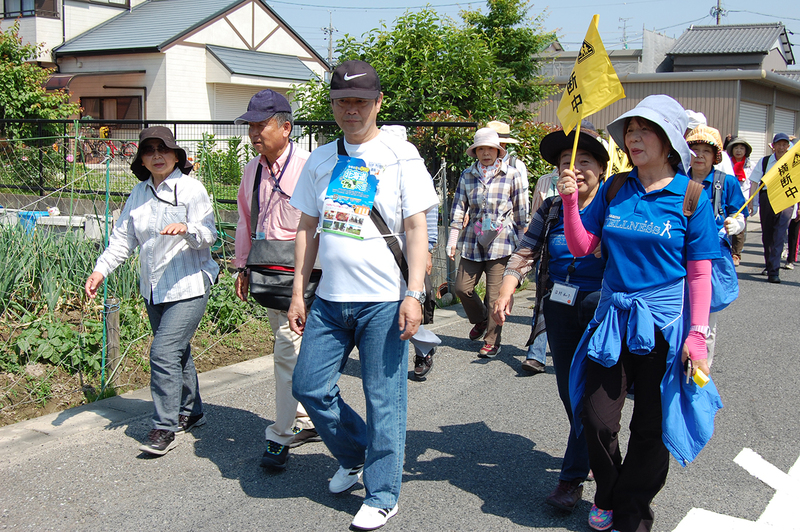 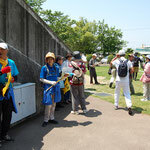 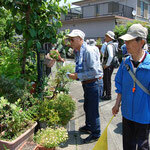 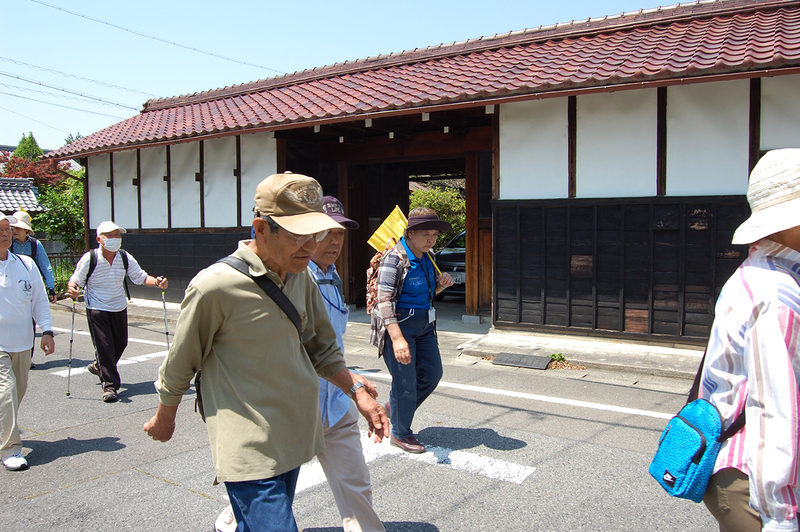 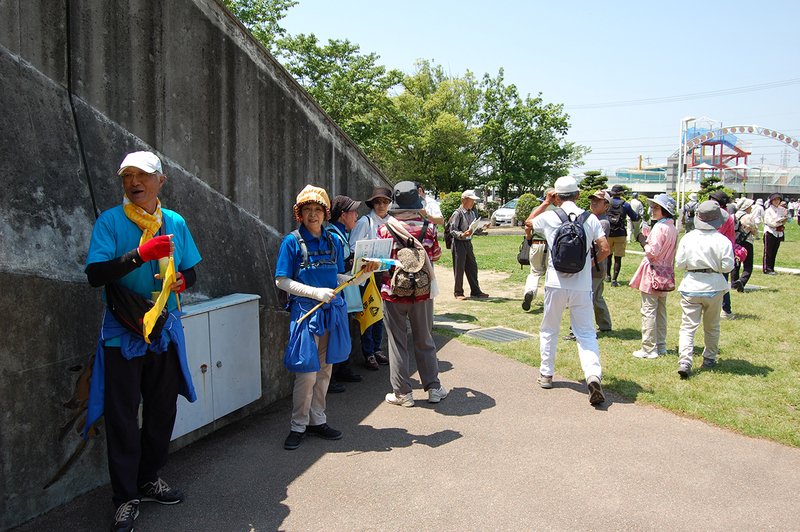 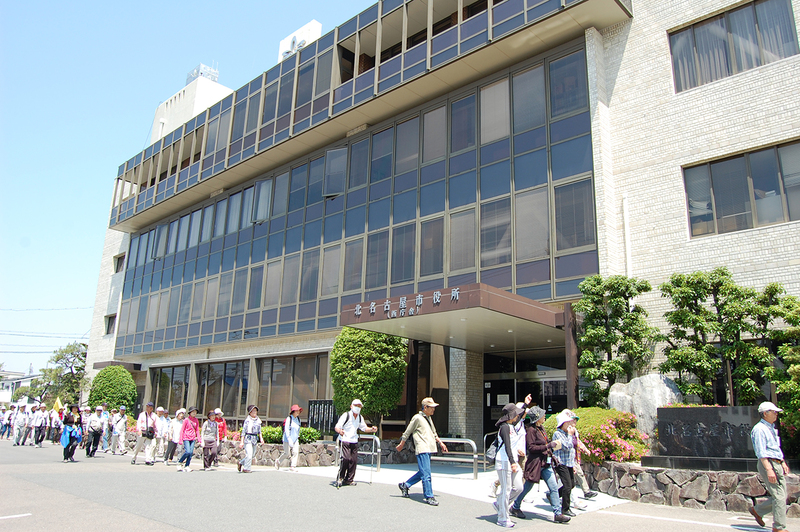 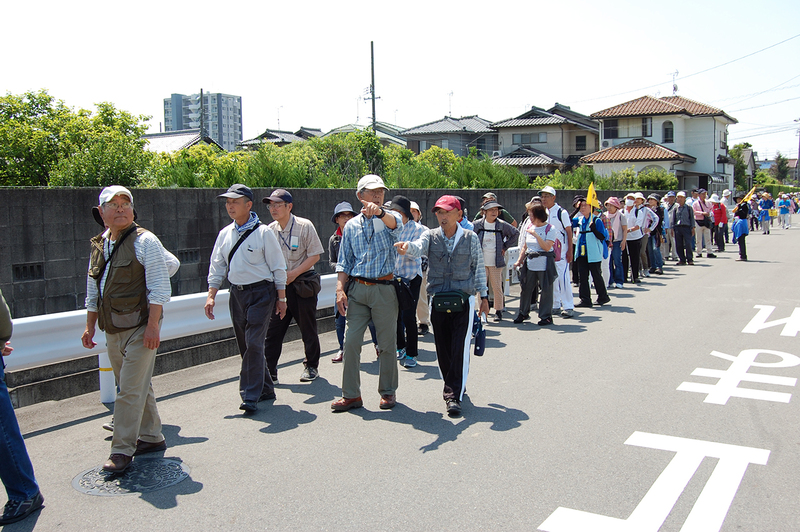 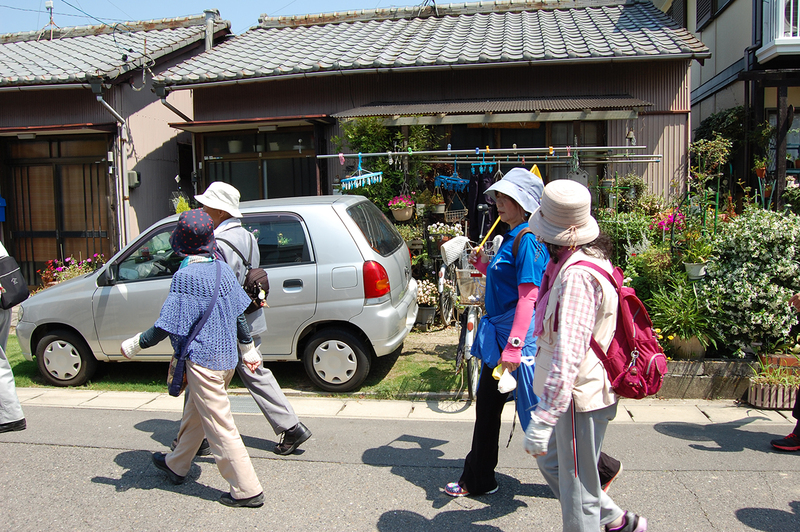 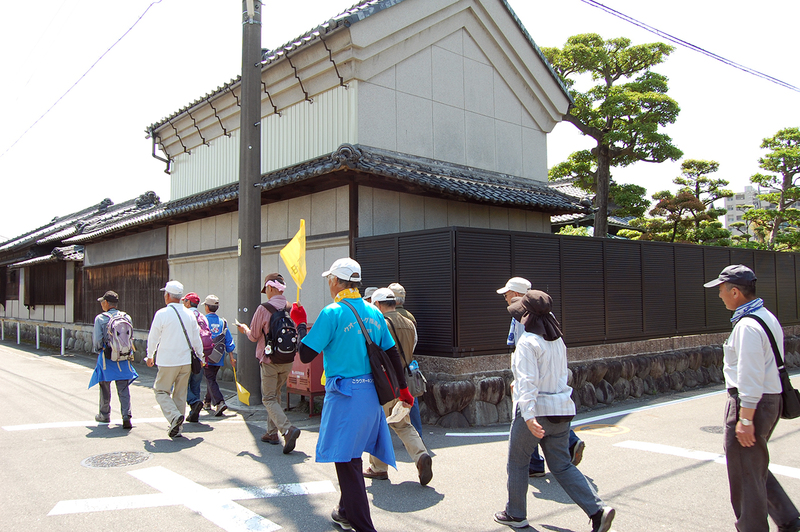 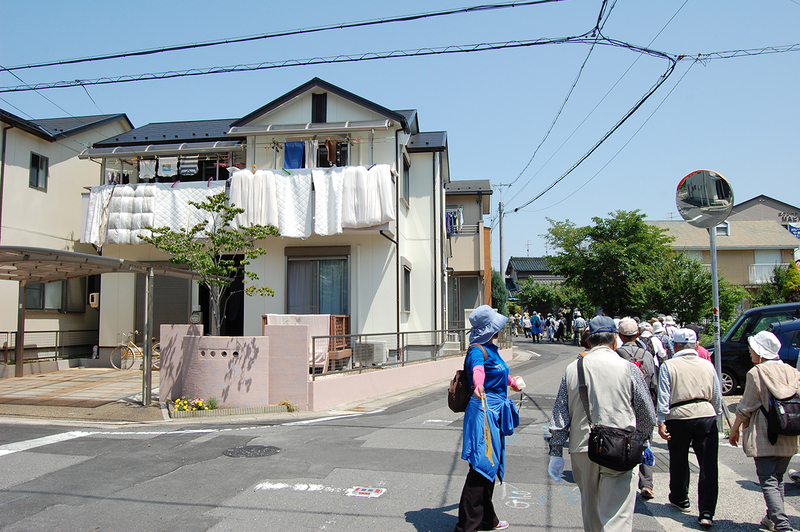 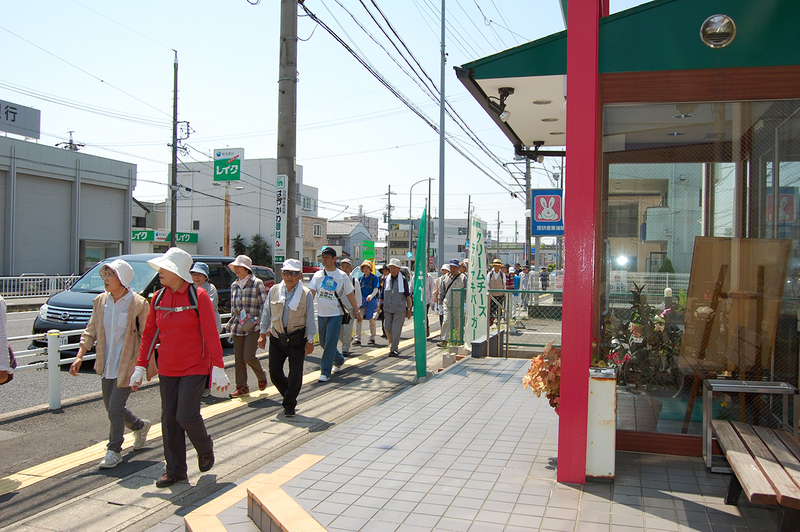 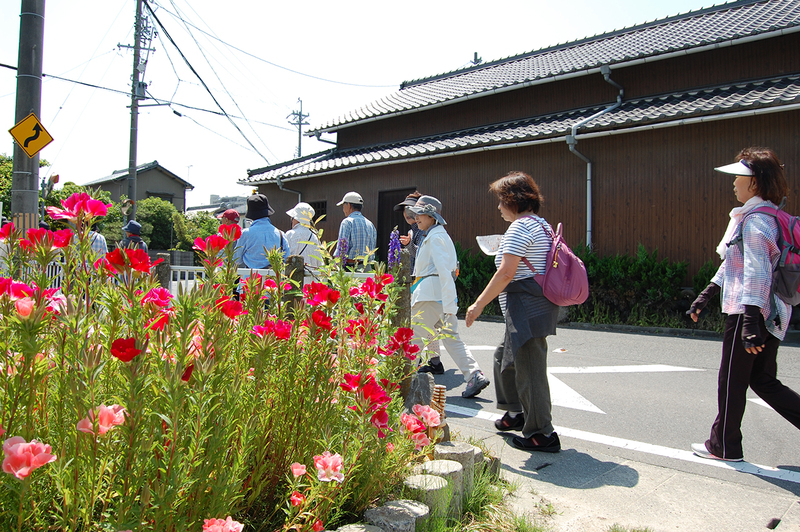 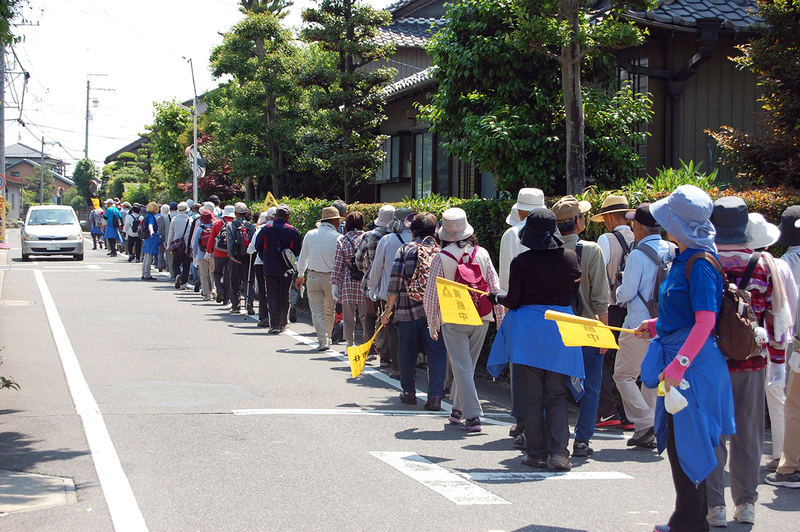 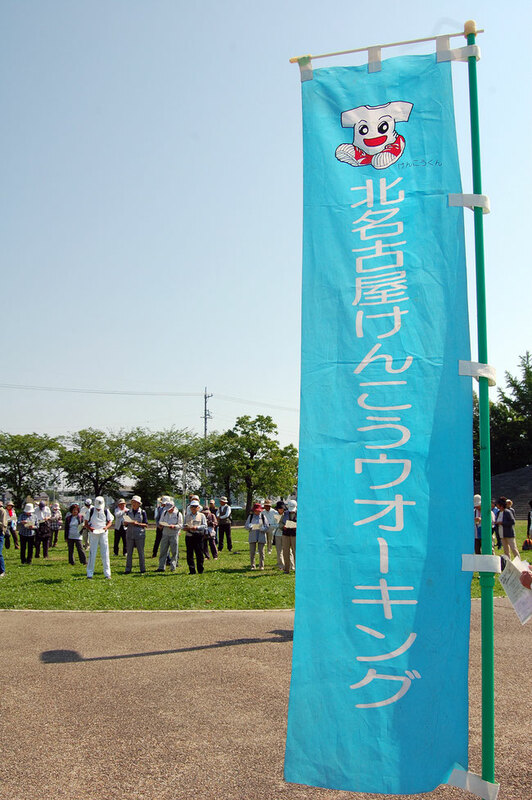 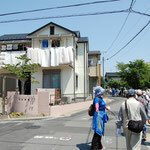 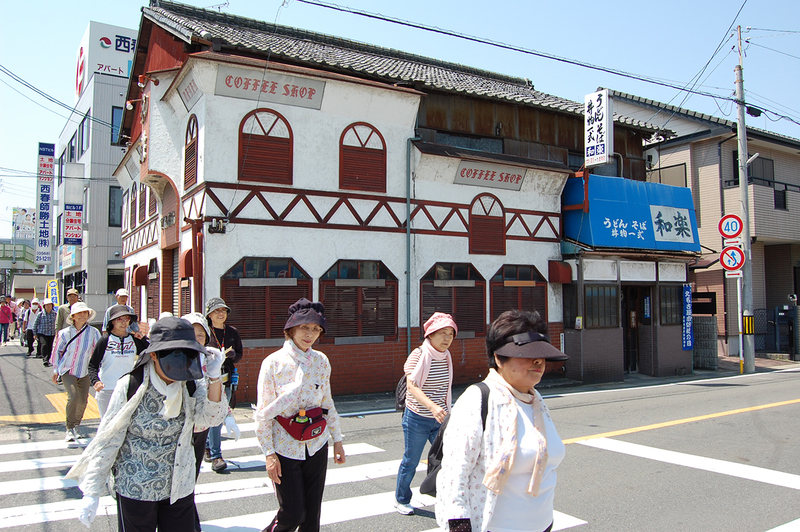 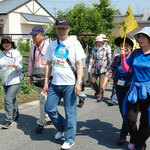 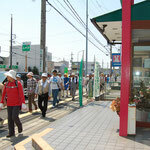 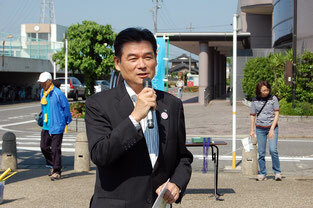 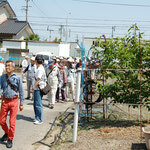 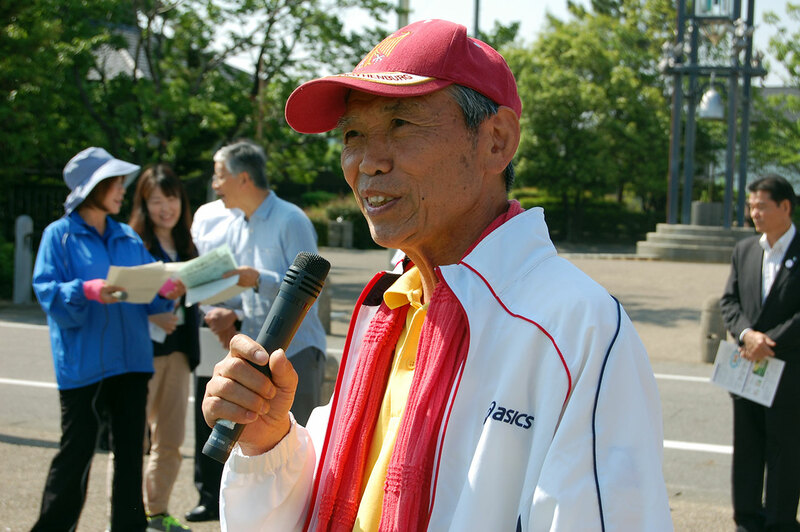 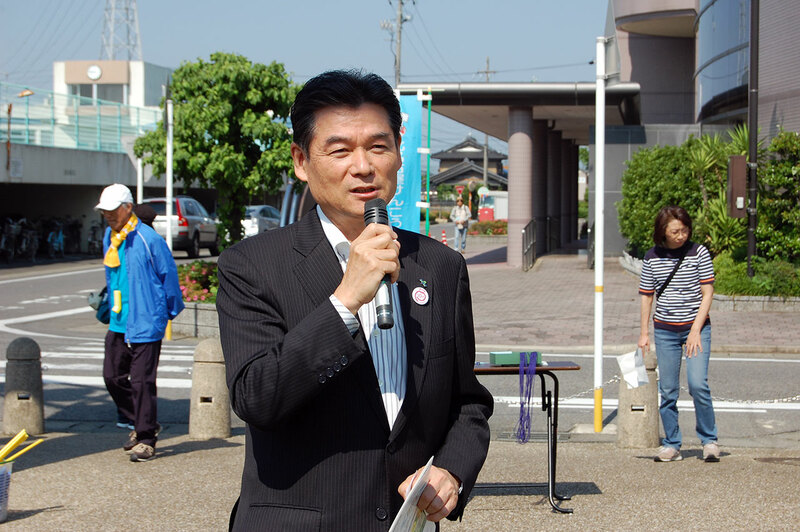 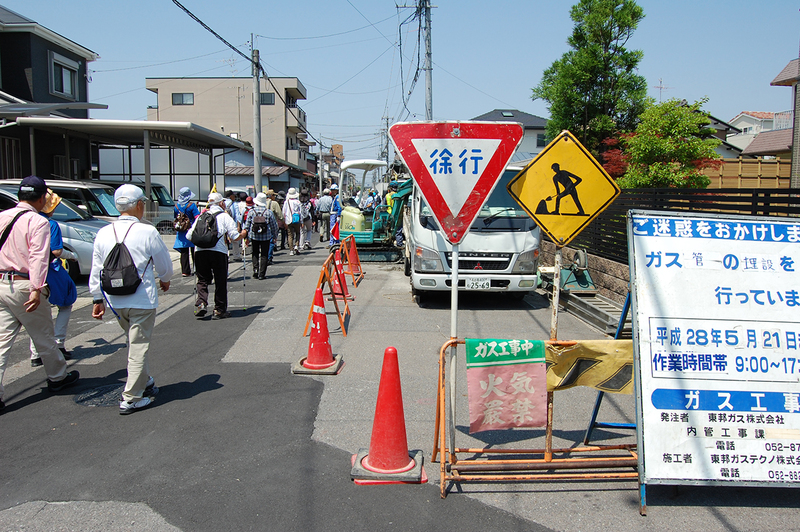 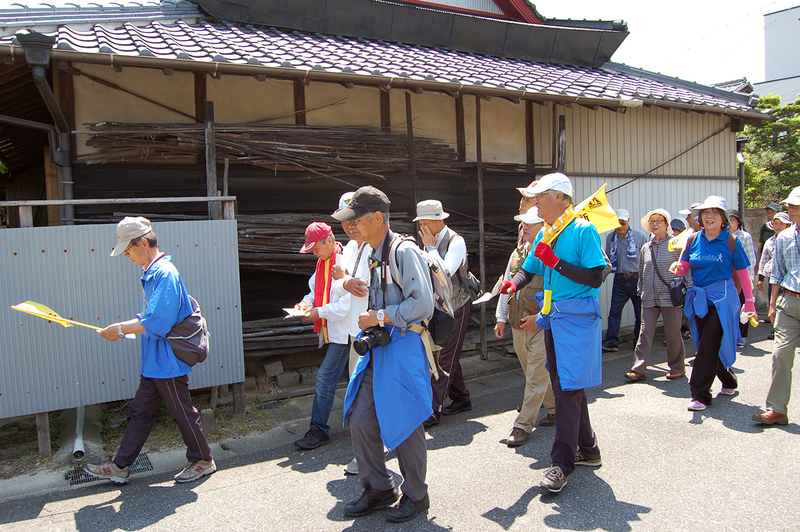 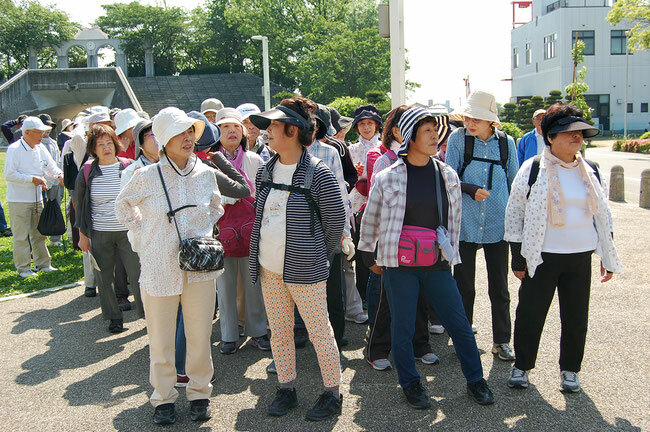 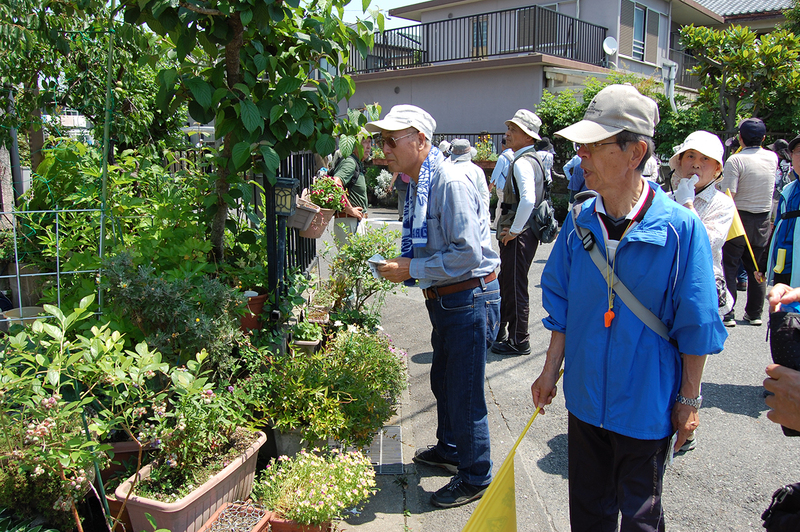 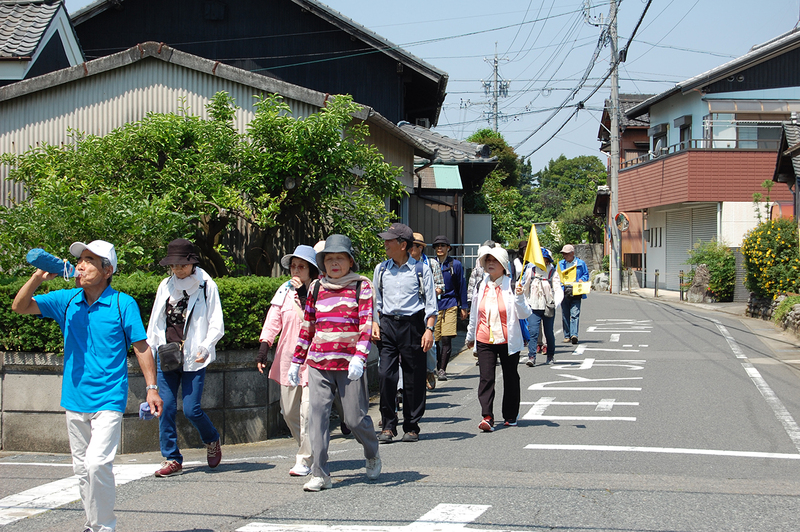 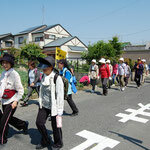 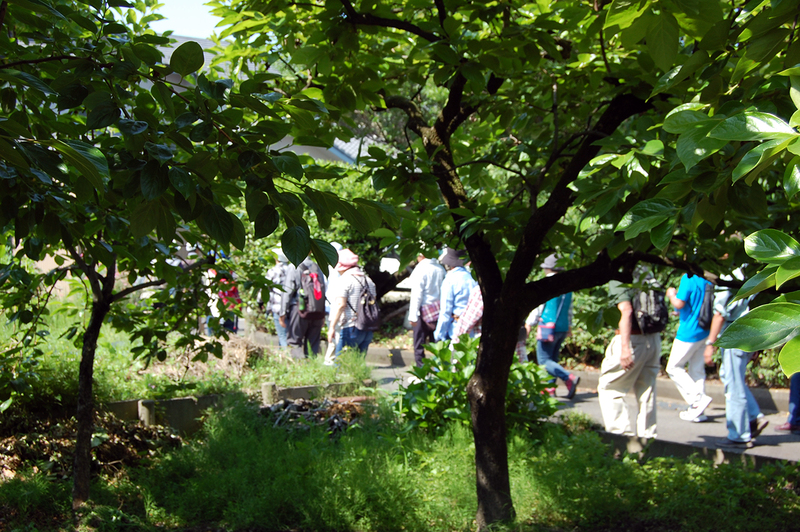 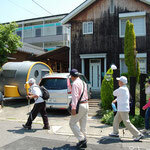 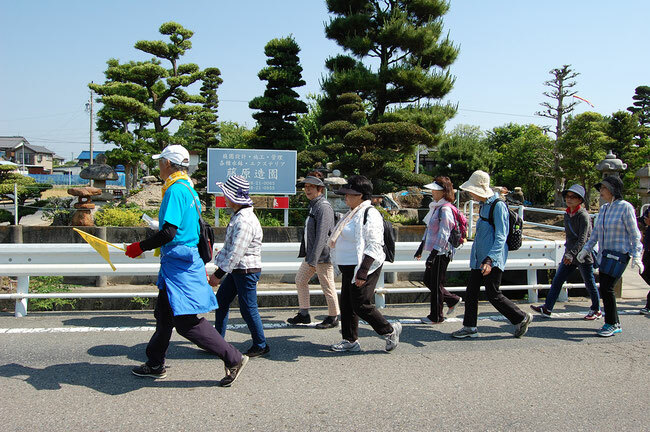 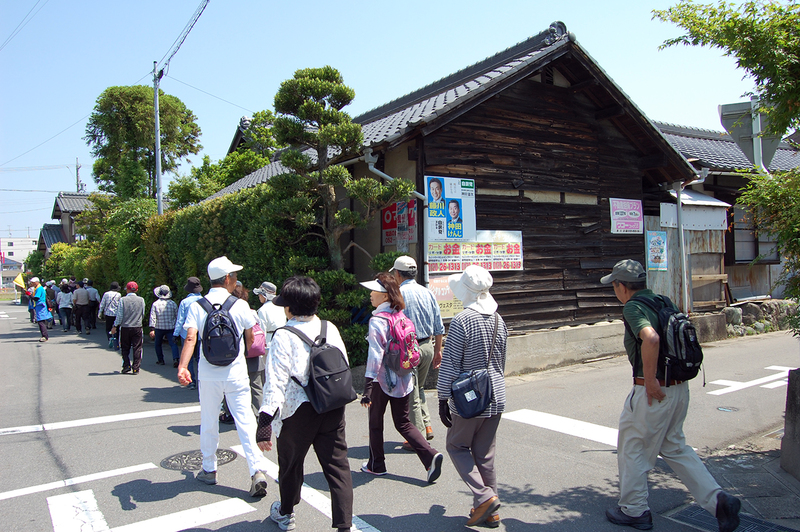 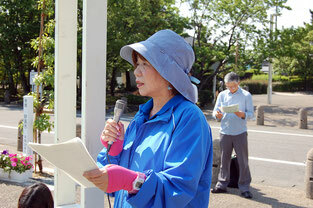 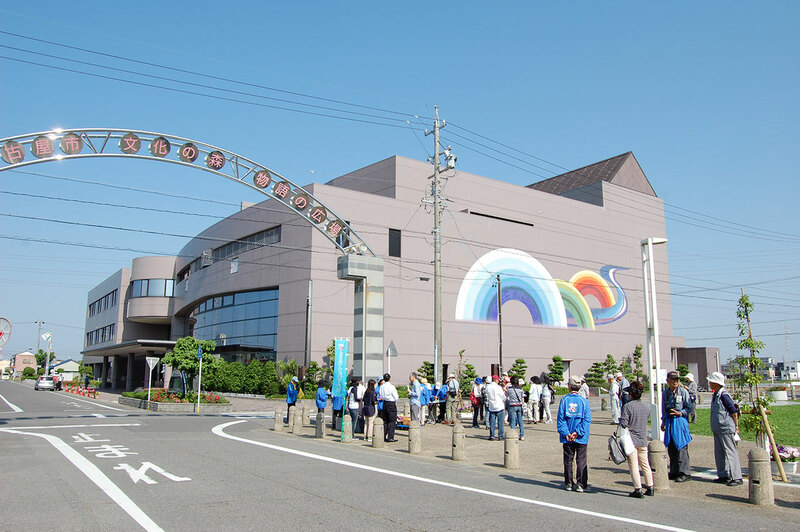 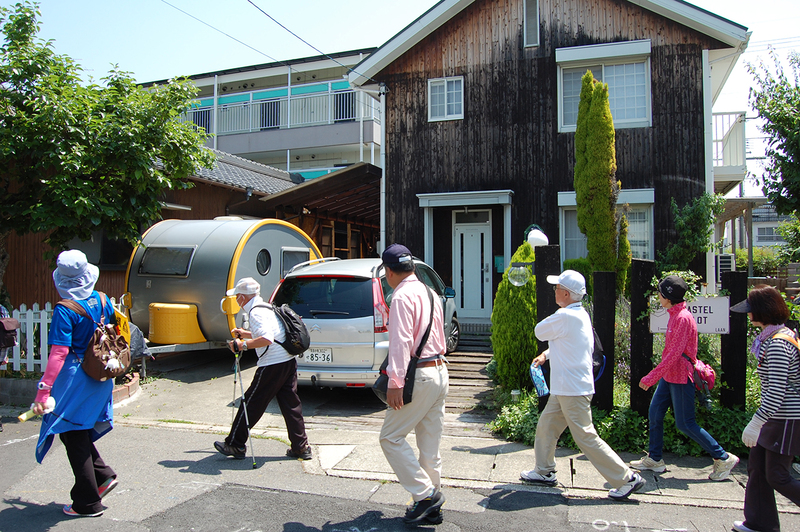 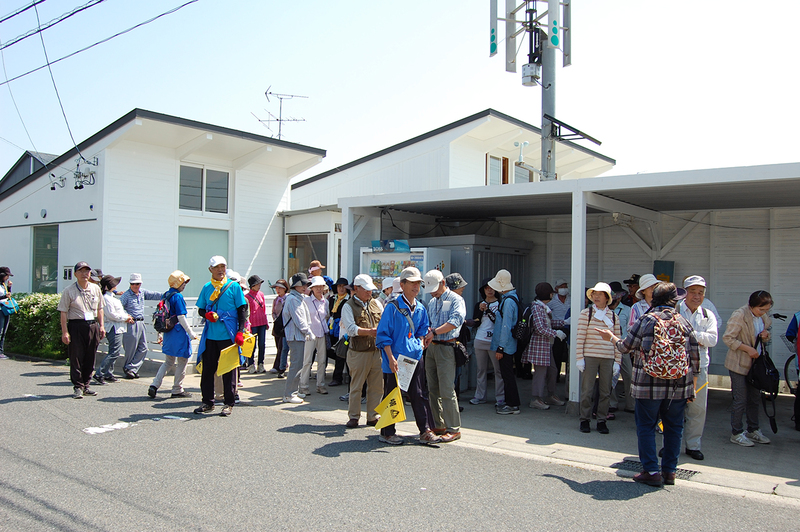 The 31th Kitanagoya City Healthy Walking was held on May 21 starting at the Cultural Labor Welfare Hall. 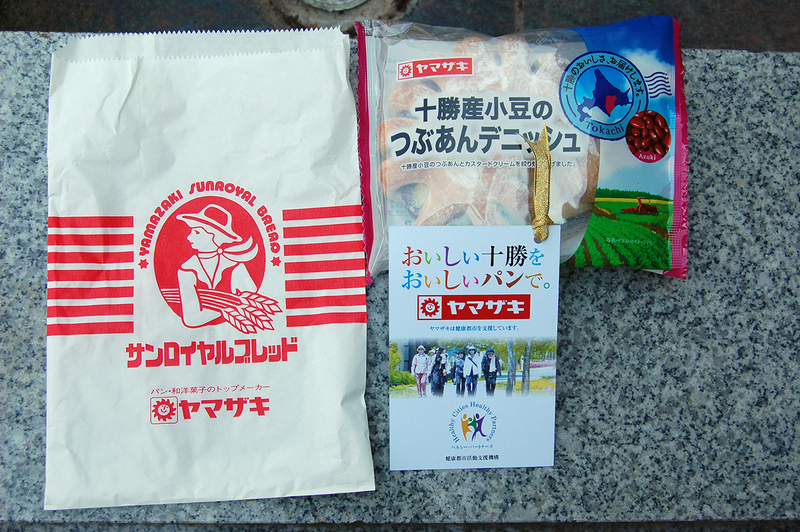 The event was organized by the Kitanagoya City Healthy Walking Committee and Kitanagoya City Health Department, and Healthy City Support Organization cooperated the event under Yamazaki Baking Company’s support as a part of the “Healthy Partners” Project. 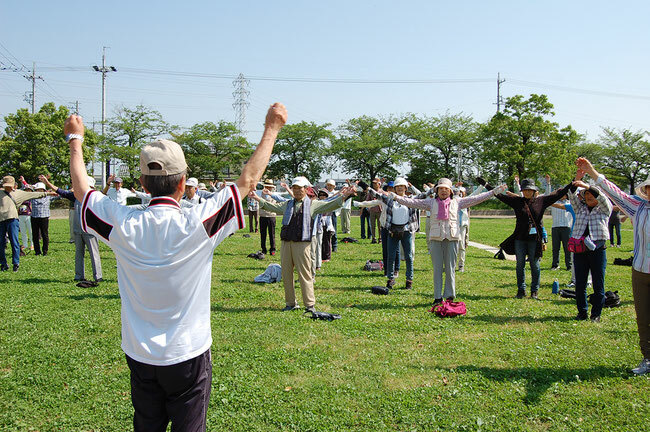 Healthy Partners is a partnership of health related voluntary organization, municipality, and Healthy City Support Organization for the purpose of promoting local community’s health by healthy food, exercise, and mental health. 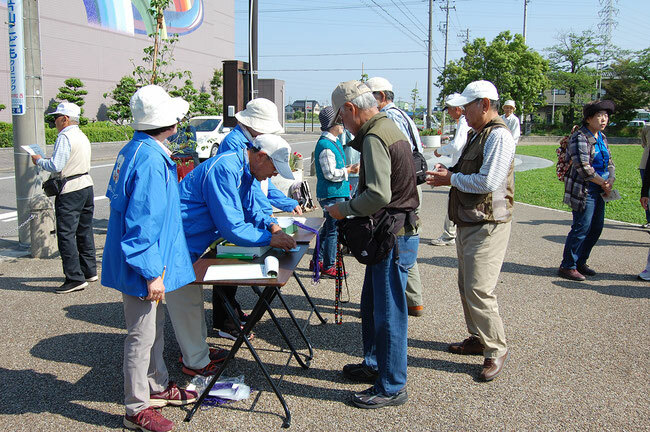 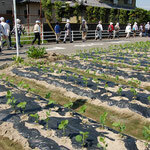 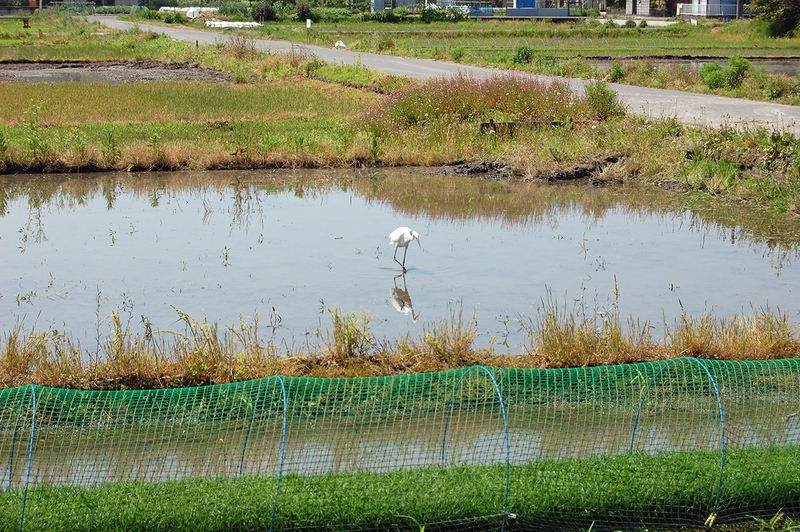 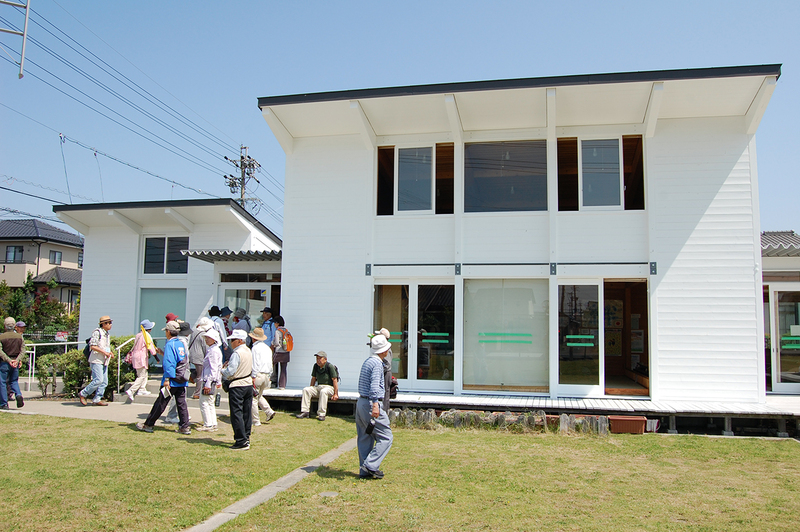 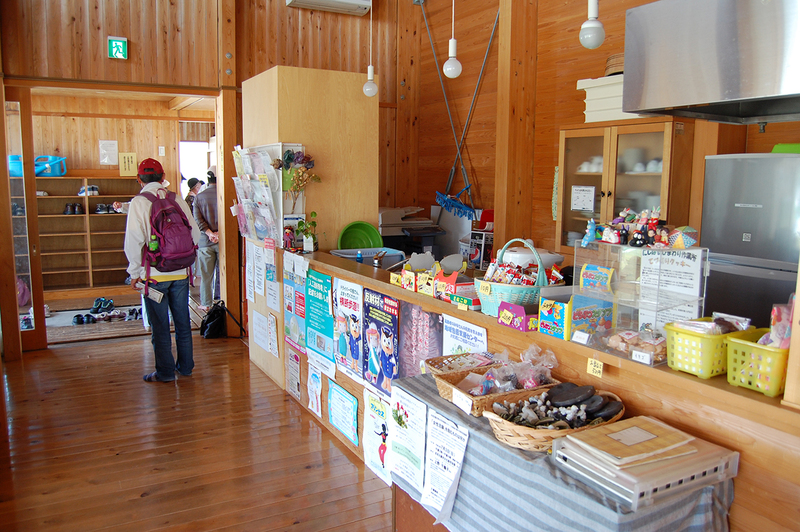 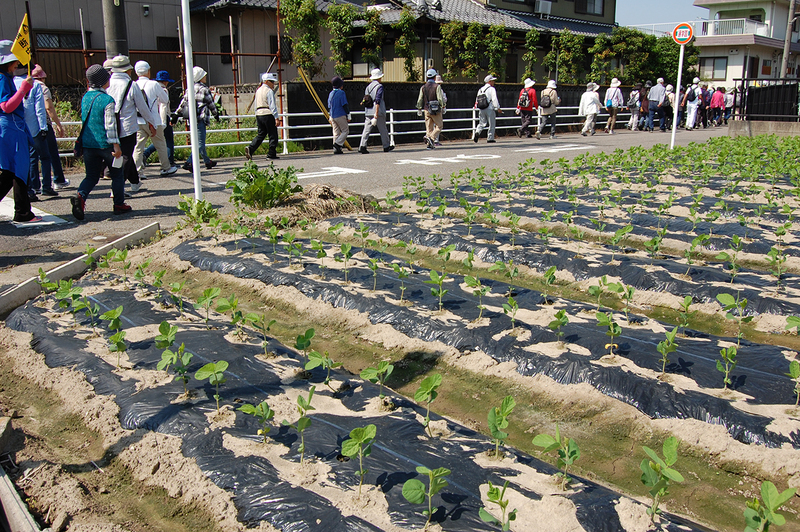 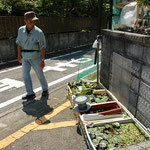 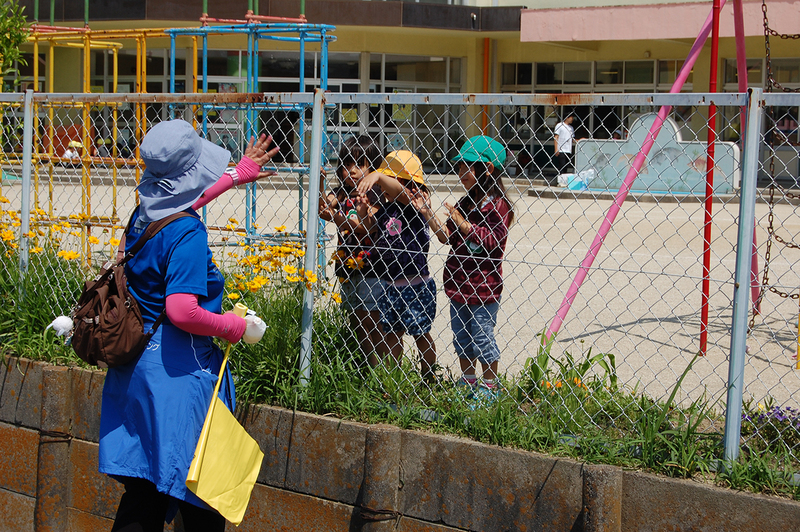 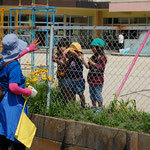 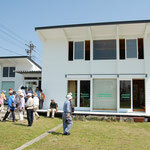 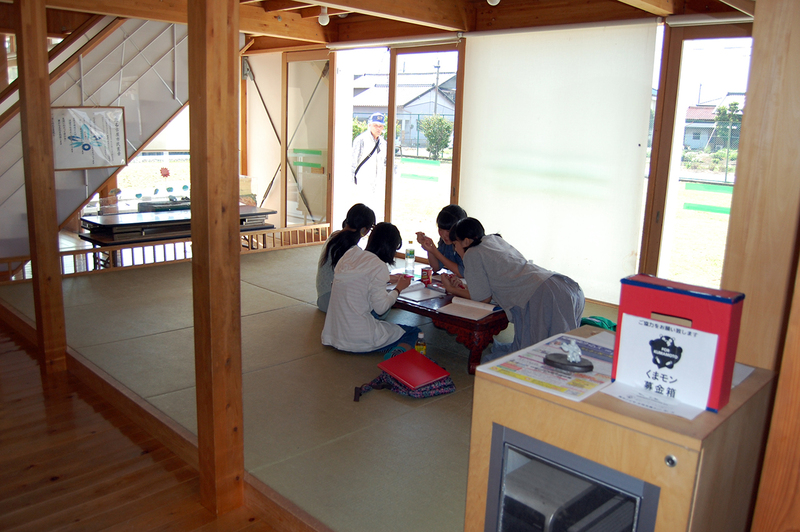 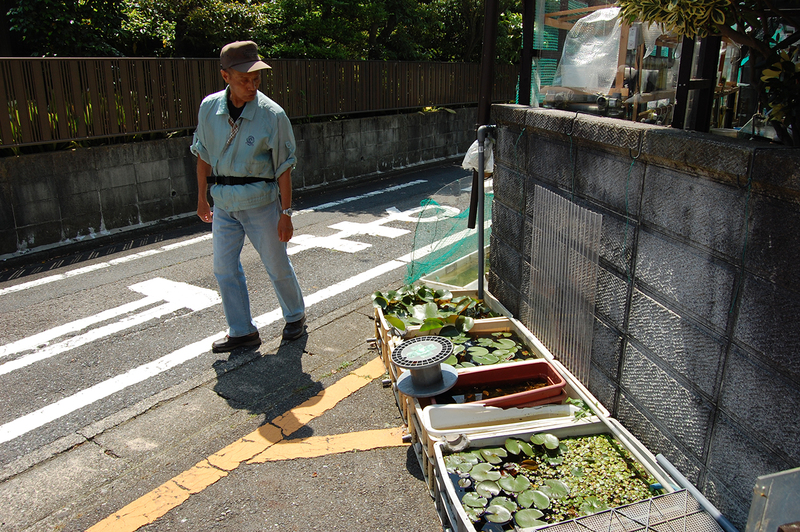 This is the first year of the Healthy Partners Project and Kitanagoya City took charge of model city. 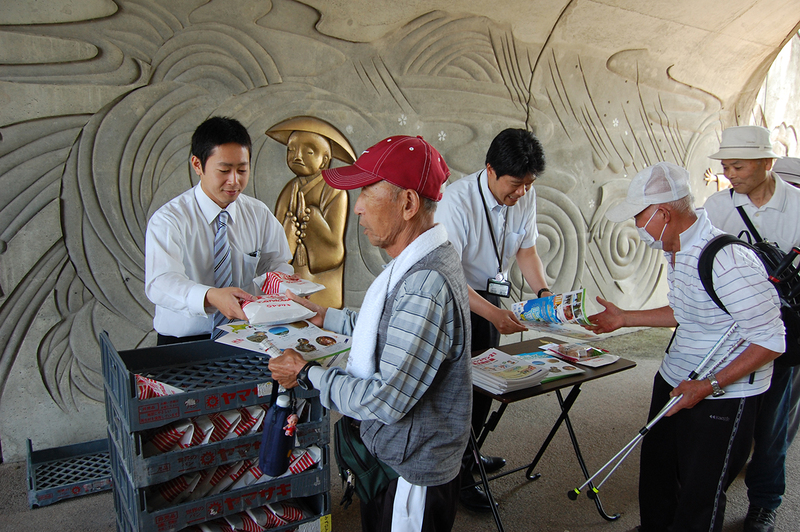 Healthy City Support Organization supplies goods and service based on the request of the voluntary organization. 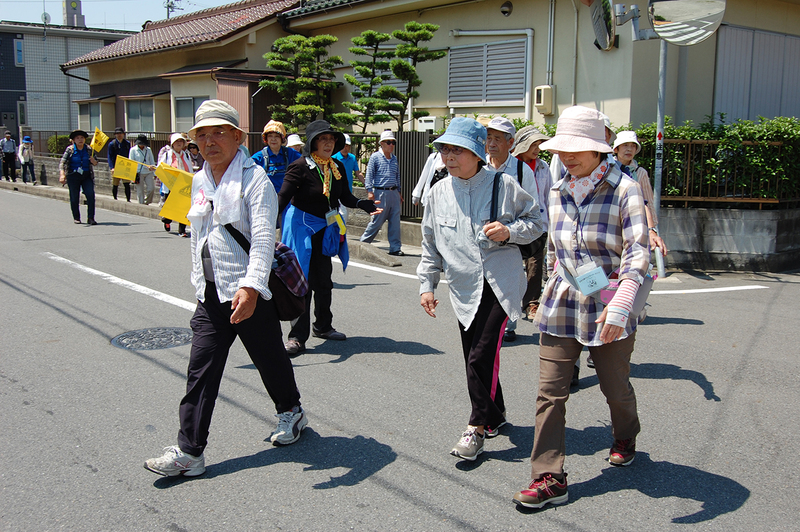 About 100 local residents whose ages are more than 60 participated. 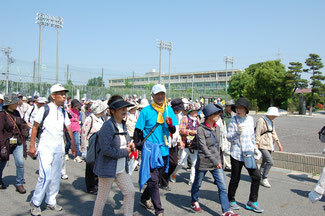 Wearing hats and backpacks, they were full of energy. 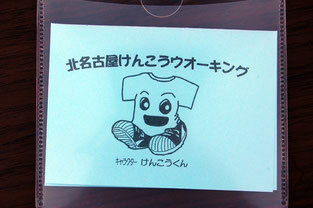 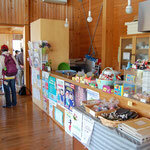 At reception desk, they stamp a card specialized for health promotion. 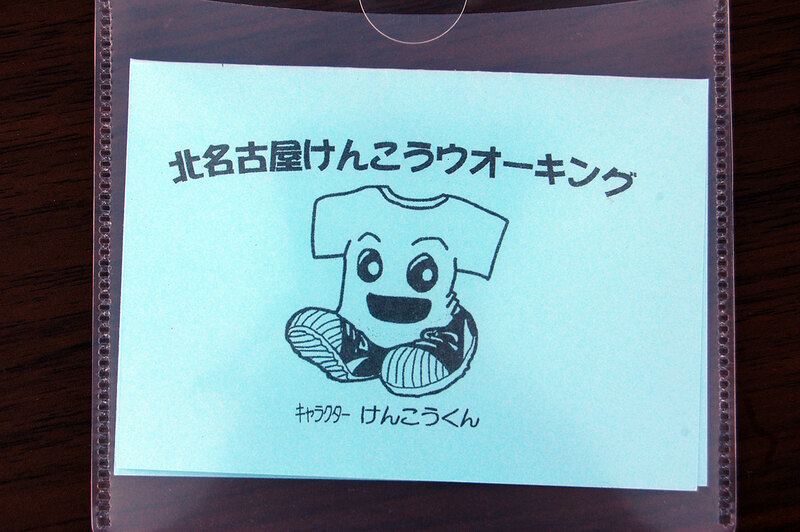 This card motivates participants because by filling the card with 30 stamps, they are entitled to get small achievement award from the city. Following greetings from organizer, they loosen up muscles by warming-up exercise and stretching. 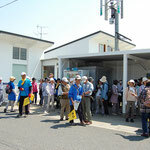 Then, they use bathroom and hydrate themselves. 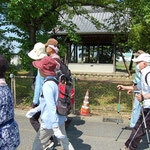 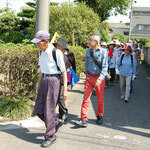 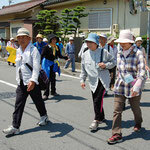 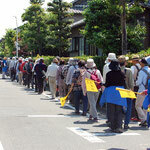 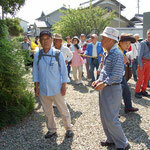 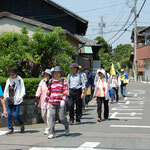 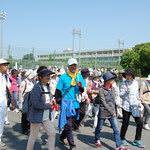 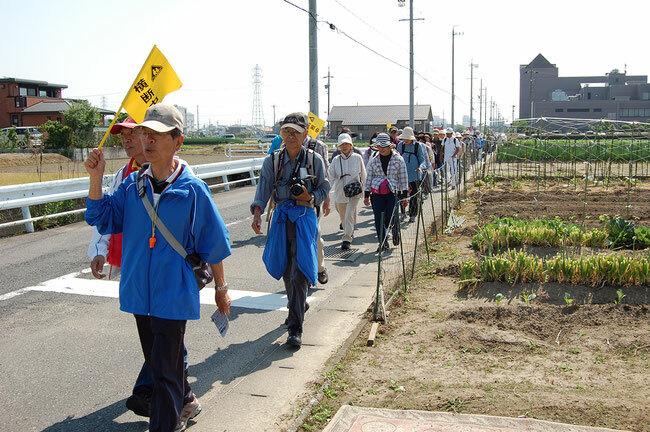 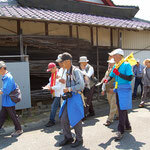 It seemed they are accustomed to walking as there are two to three walking events every month. 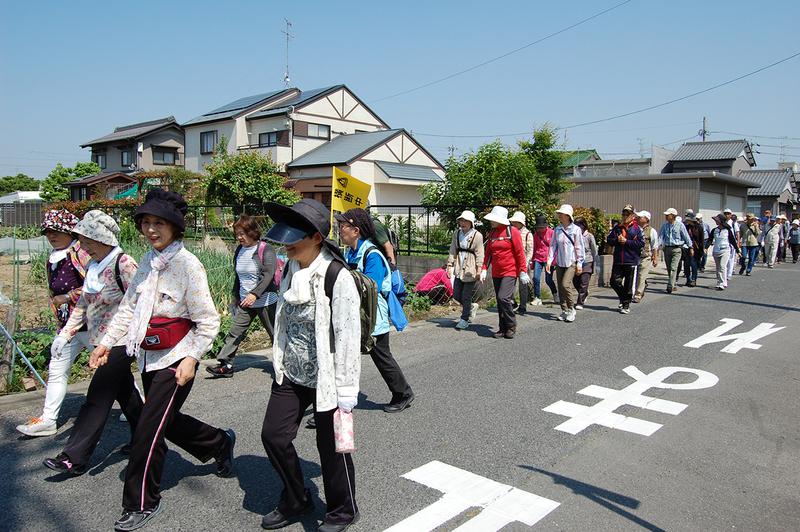 Walking Course is 5.5 kilometer distance. 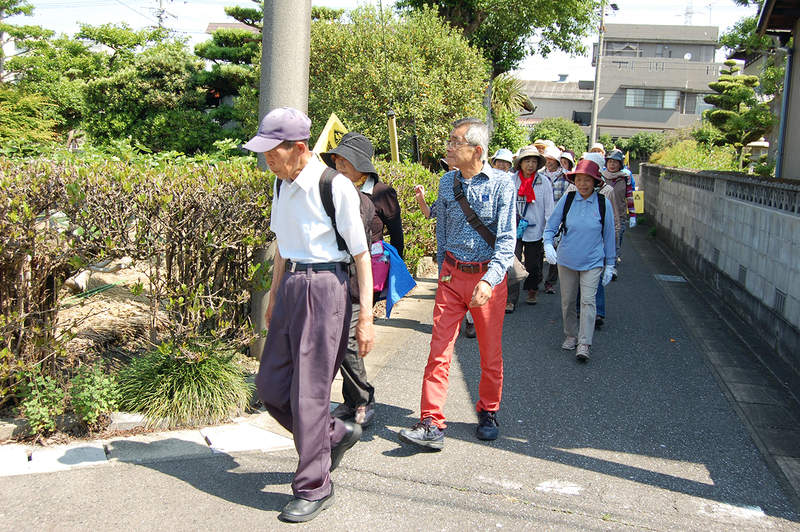 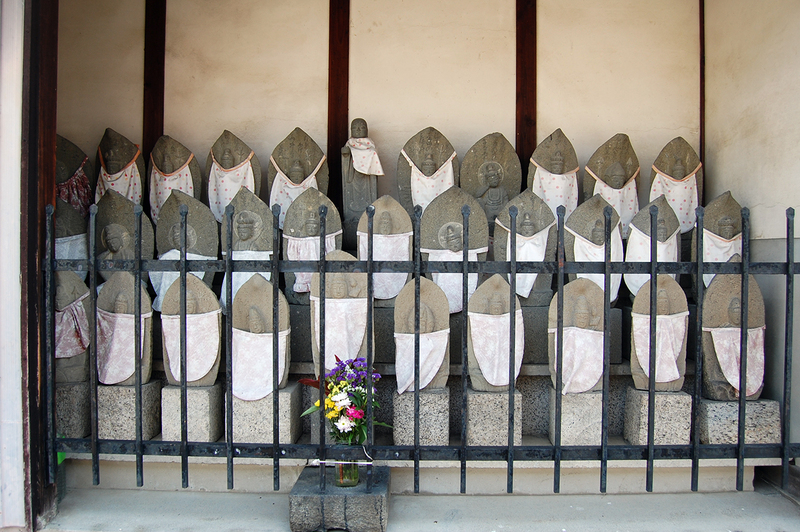 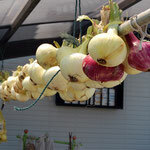 It starts from Cultural Forest and go through fields, shrines and temples, narrow street between local house gardens, downtown and goes back to the starting point. 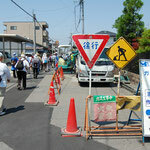 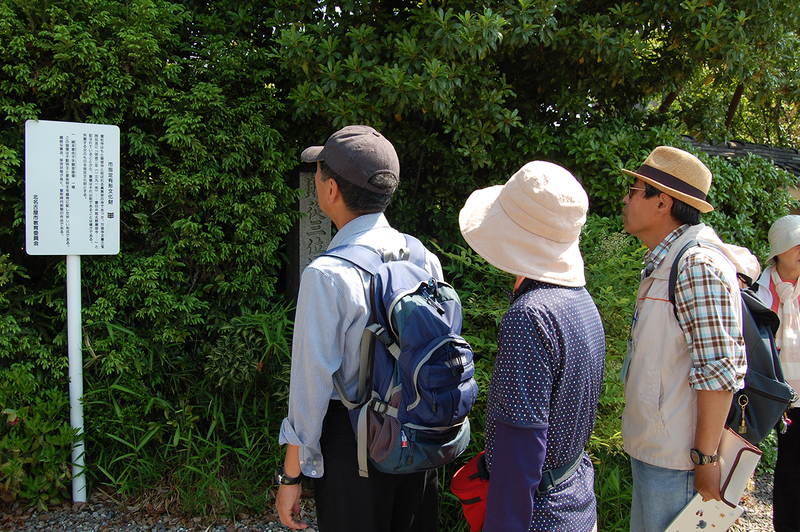 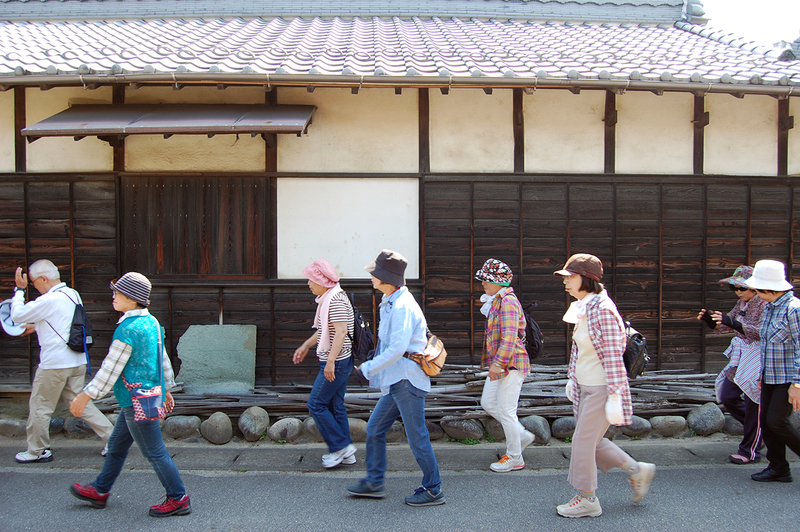 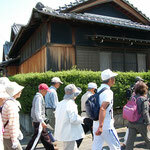 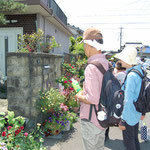 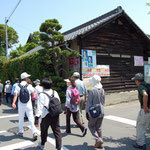 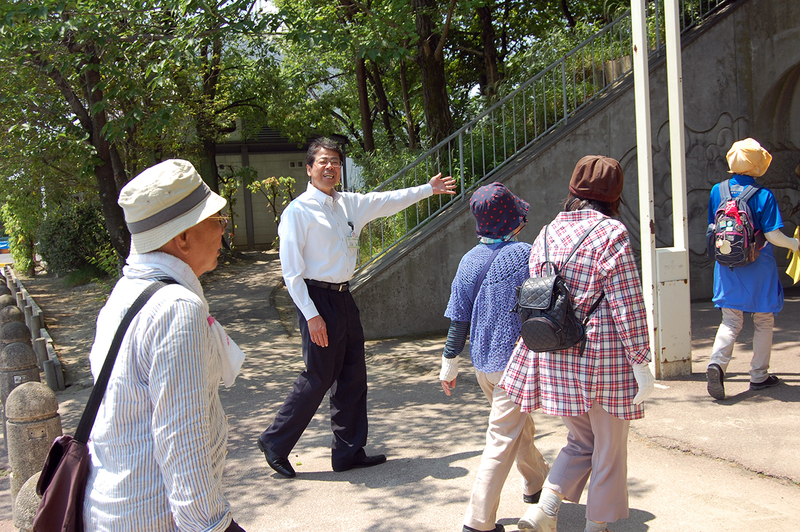 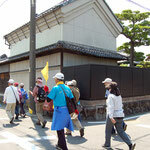 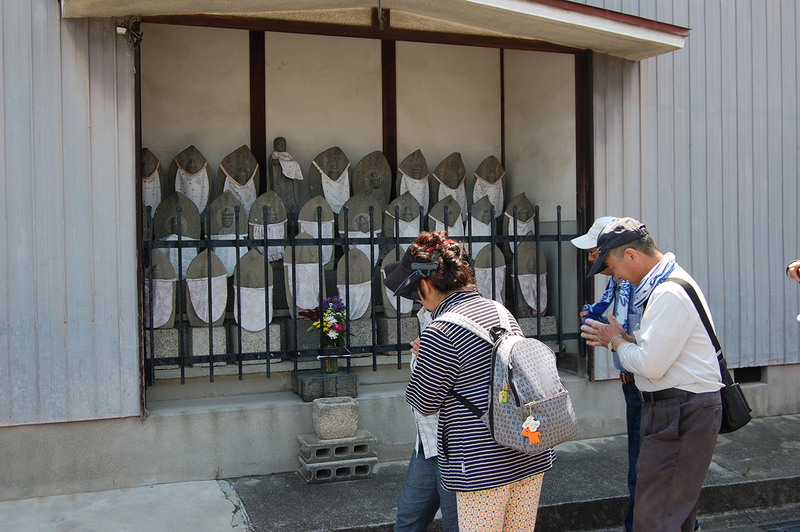 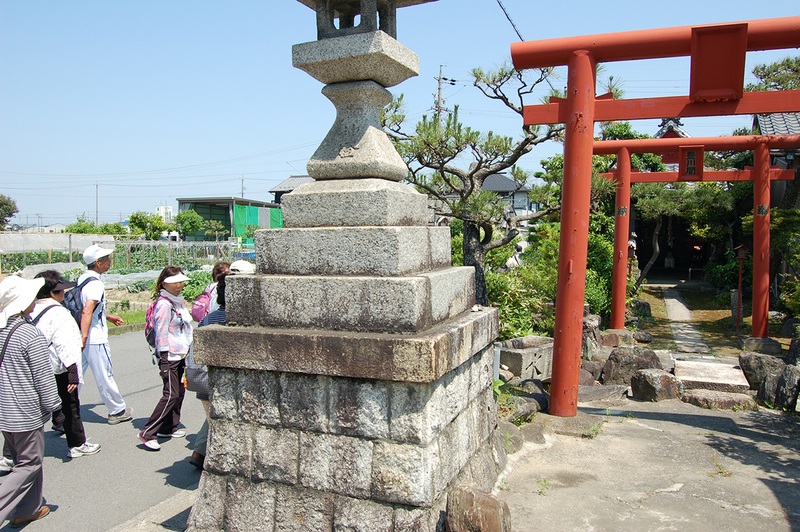 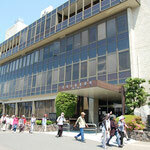 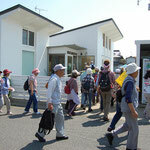 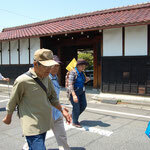 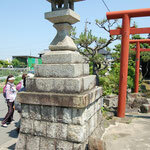 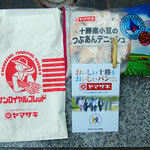 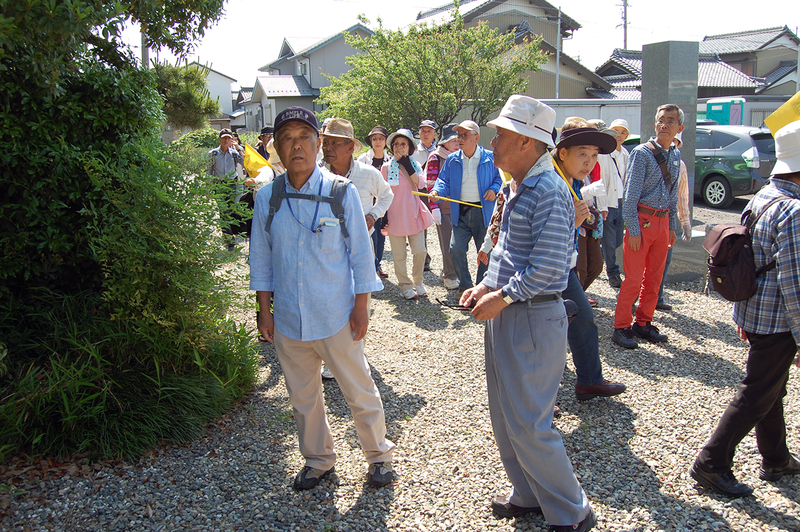 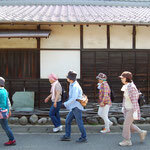 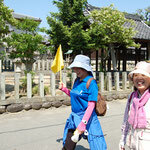 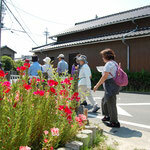 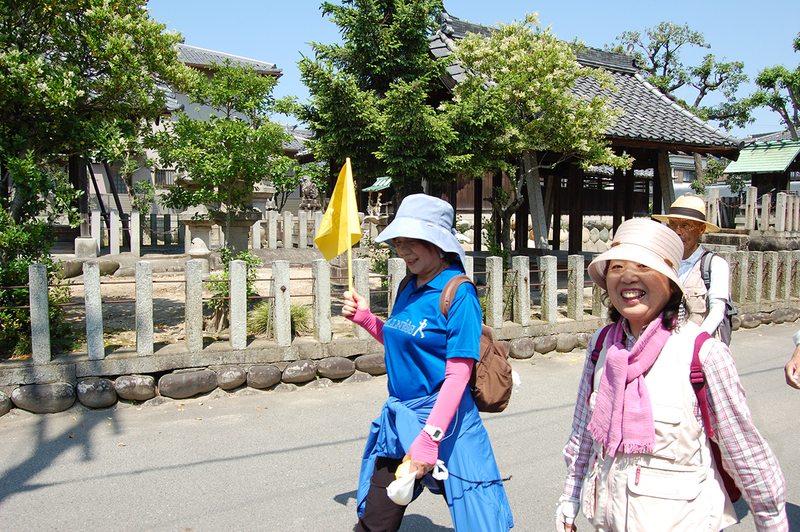 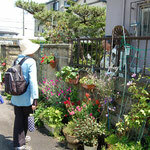 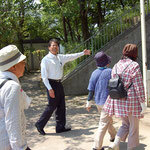 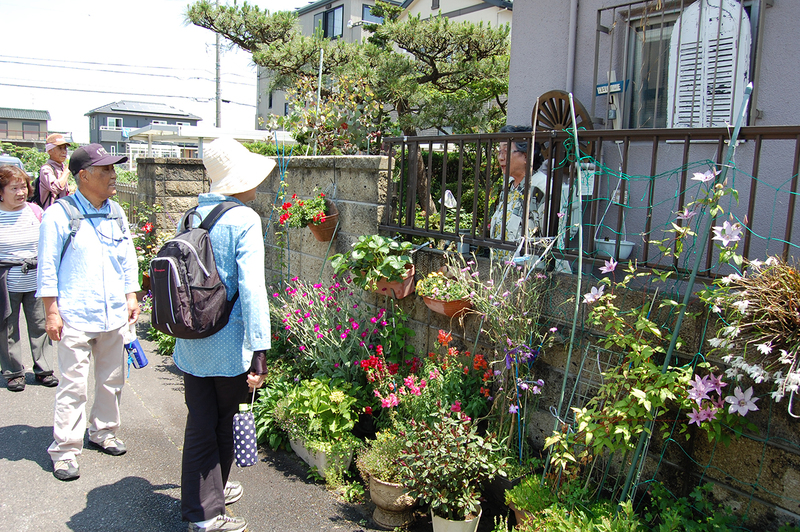 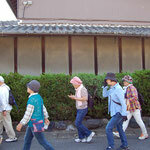 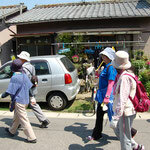 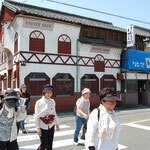 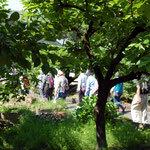 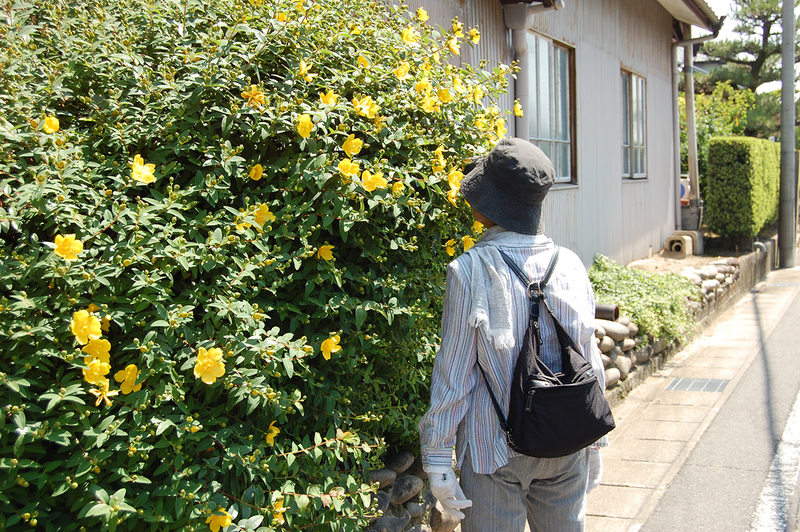 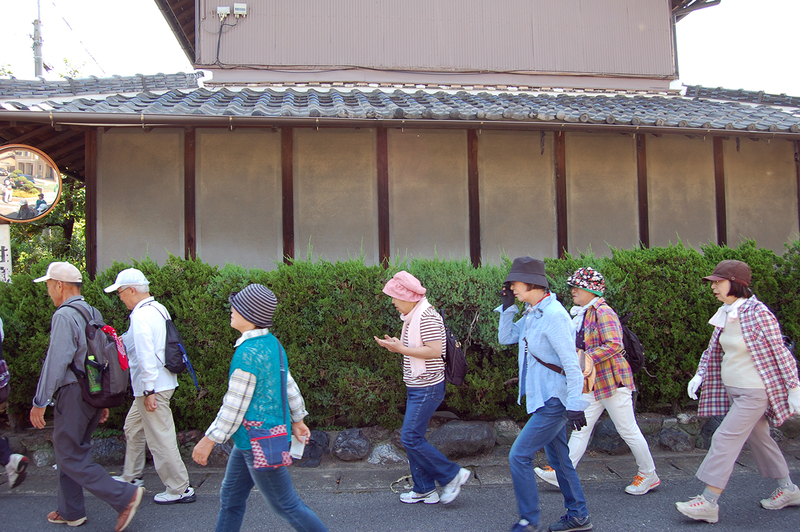 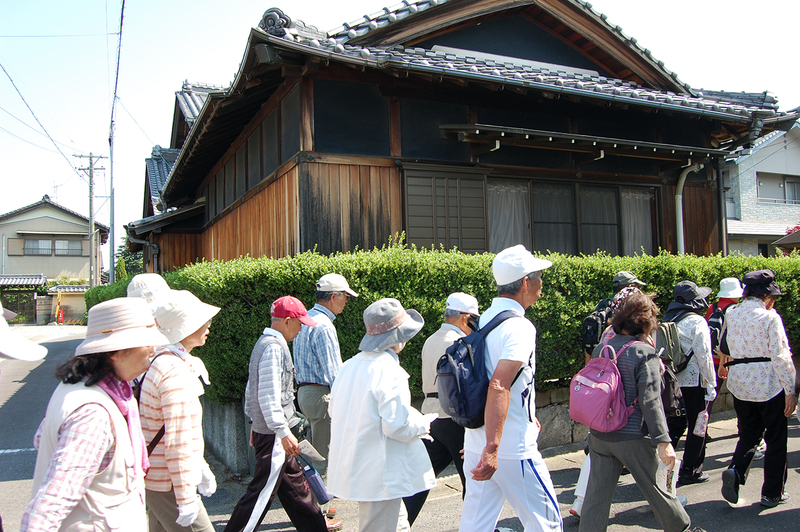 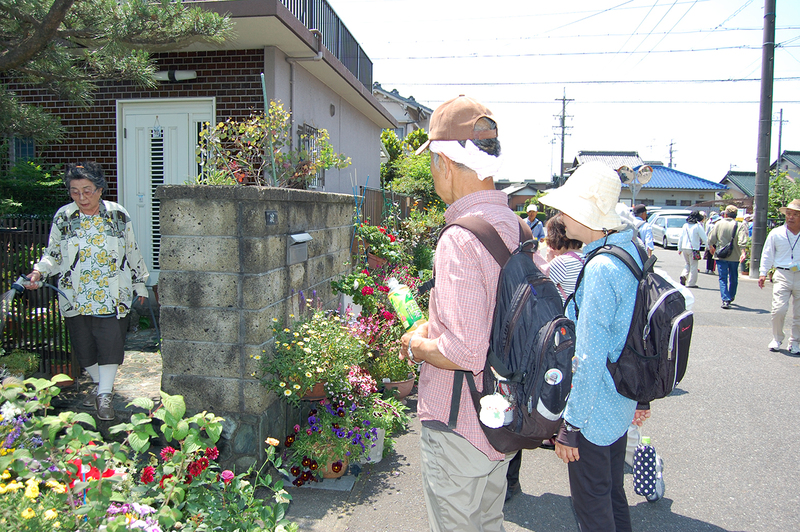 In the city, there are eight official walking courses that walking promotion member selected. 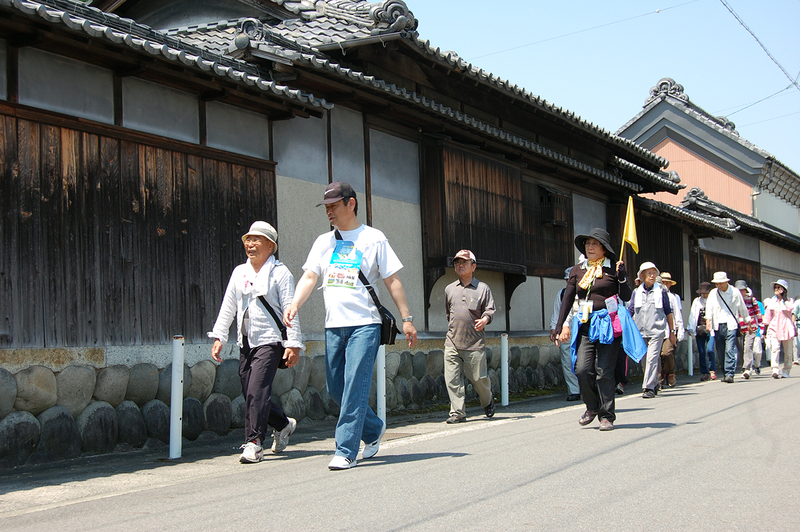 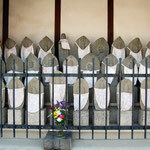 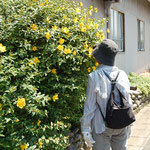 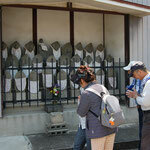 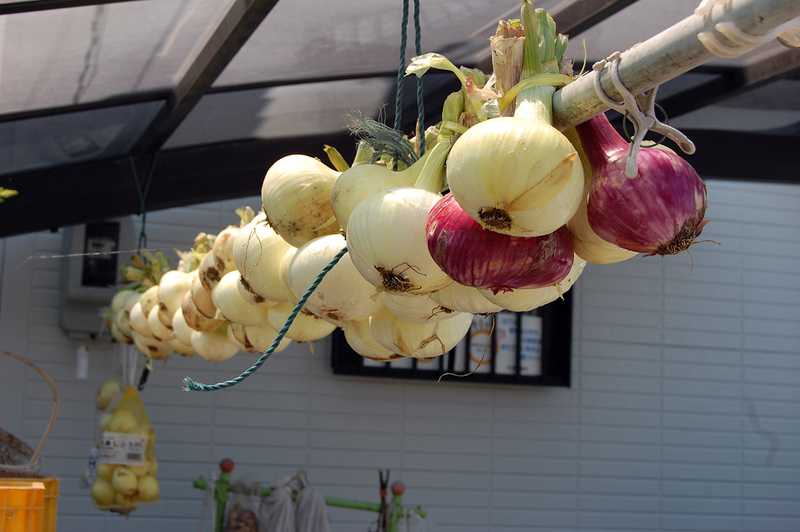 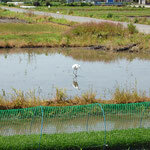 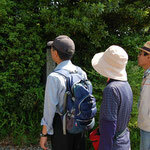 Especially, “Road of reminiscence” is chosen to “100 New Japan Walking Road Travel’s 1,000 Recommended Road”. 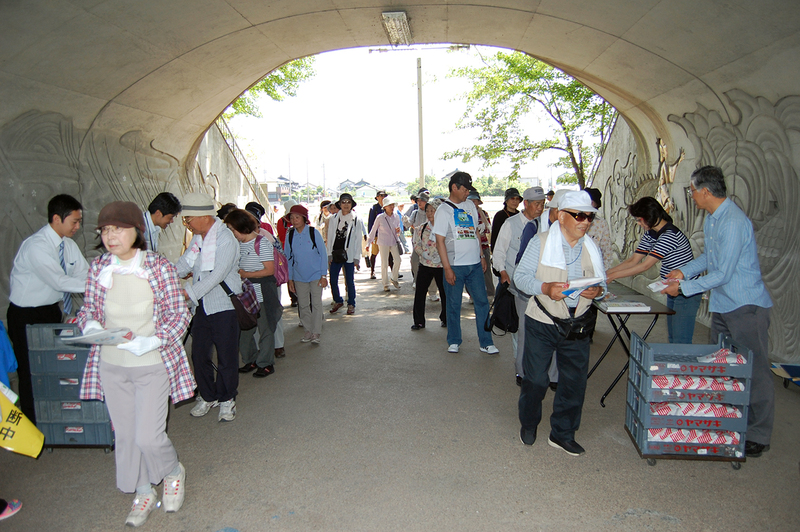 Following are the album of the event. 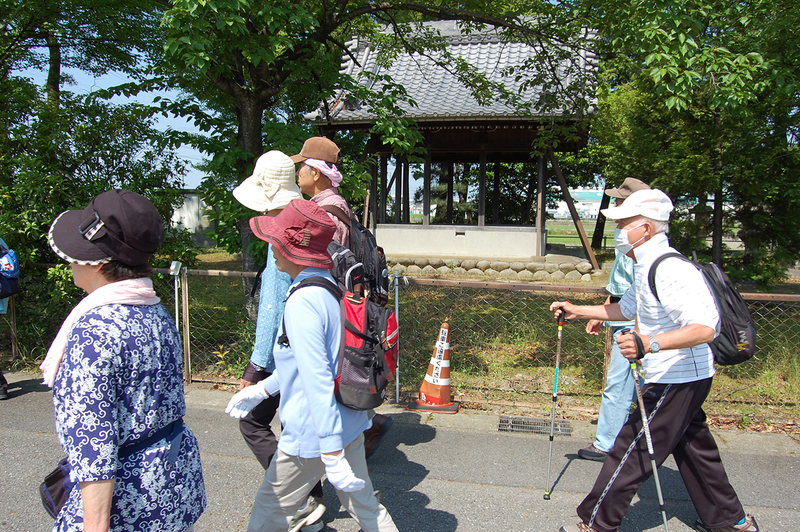 Please click each photo for larger images.